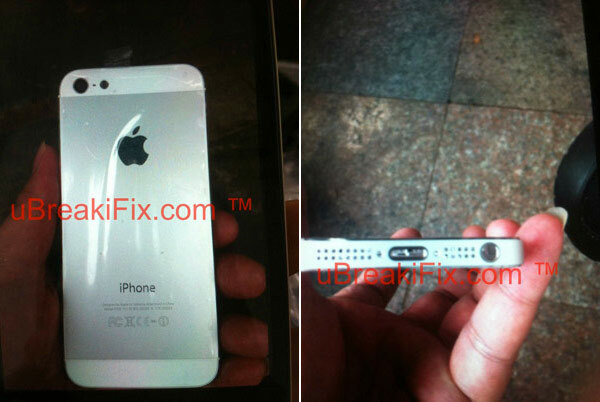 Adding fuel to recent circulating rumors of a taller iPhone 5, images have surfaced on repair website uBreakiFix that claim to show the back-panel of the new iPhone. The leaked photos show an elongated screen, aluminum backing and a smaller mini-dock connector. The photos show a glass-like material along the ends of the device, as well as relocation of the headphone jack to the bottom of the iPhone next to the new smaller dock. While the images are convincing, close inspection of the font used for the word ‘iPhone’ on the rear raise questions about its authenticity. However, with reports emerging that Apple are still finalizing the design of the iPhone 5, there is every chance that these photos could represent an early prototype. Rumors of a larger screen on the iPhone 5 have been building in recent weeks, with iLounge first reporting that next iPhone would achieve an increase in screen size from 3.5 to 4-inches by increasing the vertical height of the iPhone only. Later, the Wall Street Journal confirming large orders of 4-inch screens for the new model iPhone. Reports have been mixed regarding the design of the iPhone 5, with some rumors suggesting that the iPhone 5 would retain the current glass backing, while others suggested that Apple was planning on switching back to an aluminum back-plate, as in the original iPhone 2G.